A native Chicagoan, Moore spent his childhood in the Robert Taylor Homes, before moving to the Auburn-Gresham community. Upon completing Simeon Vocational High School, he graduated Western Illinois University with a dual major in accounting and operations management. He earned an MA with emphasis in government studies at Loyola University-Chicago. Moore established a successful accounting career in the private sector at several Fortune 500 companies, as well as with Chicago’s Department of Aviation and Housing Authority. 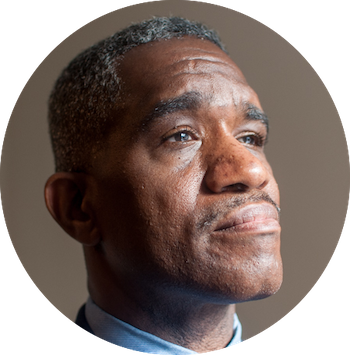 Most recently, he served as an assistant to the commissioner of the Cook County Board of Review, coordinating the Faith-based Community Initiative. His work in the public sector exposed him to nearly every aspect of government management, including hands-on experience with cost-benefit analysis, budgeting, strategic planning, directing inter-agency teams, and projecting the impact of initiatives related to such issues as urban renewal, affordable housing, land use, public works, and transportation. He oversaw projects for redeveloping the South Loop, creating job-training sites and identifying employment opportunities for low-income residents. Moore traces his “call” to public service back to his days as an 11-year-old walking the 17th Ward with his uncle, an assistant precinct captain. Years later, David became precinct captain of the ward’s Democratic Organization. He worked on behalf of local neighborhoods in several capacities, most notably successful voter registration drives, assisting officials shut down drug houses and common-sense gun legislation. He also played key roles in city, state and national elections. As alderman, Moore believes his first priority will be to tackle traditionally neglected areas in the 17th Ward–from severe unemployment and school closings, foreclosed homes and abandoned buildings, to street and sidewalk improvements and tree trimming. He believes such challenges deserve the attention of a full-time alderman, whom he considers the “front line” for facilitating progress in Chicago neighborhoods. He sits on six city council committees: Economic, Capital, and Technology Development, Housing and Real Estate, Human Relations, License and Consumer Protection, Rules & Ethics and Zoning, Landmarks and Building Standards. Moore is the proud father of Alexandria Moore and son of Elizabeth Lee—known for generously giving her time to 17th Ward residents and causes. The community recognizes him as a man of integrity, as well as for his volunteer work particularly with seniors, students and those involved with drug abuse. He is a member of the National Forum for Black Public Administrators and Rainbow PUSH Coalition. He serves on the board of the Kodero Hunter “MVP” Foundation and as a deacon of his long-time religious home, Fellowship Missionary Baptist Church.